There is a new type of outdoor furniture in town, and it’s called “rattan” but not what you might expect that to mean! Over the 19th Century, the natural form of rattan became very popular (often referred to as Cane furniture) but during the 21st Century there has been a trend into a new type of synthetic rattan. This was designed to combat the common issues found with cane furniture, which were that it degraded when left outside, and tended to become very hard and unforgiving over time. This new style of modern uPVC rattan furniture is designed not to rot or fade when left outside, and remains lightweight due to the aluminium frames. 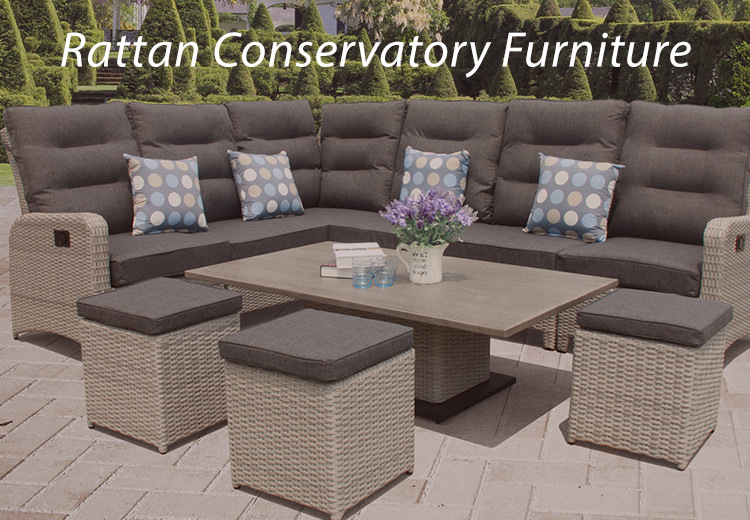 Are There Benefits To Choosing Conservatory Only Furniture? When you’re relaxing in your conservatory, there are few things that compare to having a large corner sofa set to spread out on. It’s imperative that cushions are included, to provide that extra level of premium comfort. To take it to another level, the hand woven nature of rattan means that each chair has a natural cushioning effect in the weave, creating a hammock like comfort whilst still being supportive for your back. They can also be used inside and outside, giving you flexibility during the summer months.